Abi Smithson, the 10-year-old entrepreneur and founder of Love Sandal, a woman’s footwear startup in Toronto, got a surprise delivery from UPS Canada. 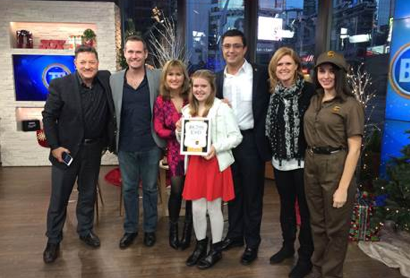 Live on CityTV’s Breakfast Television Toronto yesterday, Paul Gaspar, UPS Canada’s director of small business, surprised Smithson with an $8,700 (USD) donation to her Indiegogo campaign to support the launch of her startup. Smithson, the youngest member of Ryerson University’s Digital Media Zone, started the campaign in October to crowdfund for her brand. The donation from UPS took her just over her intended goal of $15,000. This will fund her first order to the Aldo Group and set up distribution worldwide. That’s why she plans to donate 10 per cent of the net profit of Love Sandal sales to the SickKids Foundation. Smithson’s entrepreneurial ambitions began when she took Kids Learning Code, a program ran by the Toronto-based Ladies Learning Code to teach programming and other technical skills to youth. Through the program, she developed her own video game and learned HTML coding, CSS and Google Glass. The idea for the Love Sandal, “a shoe for girls and women that leaves hearts in the hand when you walk,” traces back to two years ago. Two summers ago, Smithson noticed the tan lines on her mom’s feet while they were in the car. “It would be better if the tan lines were in the shape of a heart,” she said. Entrepreneurship runs in the family. Smithson’s mom, Julie, and her dad, Alan, are both entrepreneurs themselves. They manage SmithsonMartin, a Toronto-based startup (of which Alan is co-founder) that specializes in multi-touch control applications for music, recording, professional lighting and performance art. Smithson is also developing an online toolkit for young Canadian entrepreneurs like herself and has other ideas in the pipeline. “My dad and I are always looking at problems and trying to solve them through software,” she said.